Studio Voltaire is one of London’s leading independent arts organisations. Established in 1994, Studio Voltaire has developed a reputation for supporting artists at a pivotal stage in their career through an ambitious public programme of exhibitions, commissions, live events and offsite projects. The programme aims to facilitate projects that may not always be supported within institutional or commercial frameworks, offering substantial critical and practical support to artists, enabling them to develop new work on their own terms. Studio Voltaire places great emphasis on risk-taking and allowing artists to explore new elements within their practice. Previous solo commissions have included Dawn Mellor, Simon Bedwell, Cathy Wilkes, Henrik Olesen, Nicholas Byrne, Spartacus Chetwynd and Thea Djordjadze. For this exhibition Studio Voltaire presents, Studio Voltaire have curated an exhibition with emerging artists from London and Glasgow. Laura Aldridge, who studied at Glasgow School of Art and is currently on residency in Amsterdam, works with poster prints combined with found objects and with sculptures. After going to the Slade School of Fine Art and the Royal Academy in London Danish artist Peter Linde Busk now lives and makes his etchings, collages and paintings in Berlin. British painters Joel Croxson, Gabriel Hartley and Alistair Frost all studied at the Royal Academy – Croxson and Hartley live and work in London, while Frost is currently on residency at the Rijksakademie in Amsterdam. Brazilian Erika Verzutti studied at Goldsmiths College in London. Her sculptures reveal their process of making and engage with issues of craft and representation, bringing into question cultural categories. London based Sam Windett paints everyday objects such as wheels, cups, straws and jugs in a dark palette reducing any narrative to almost abstract shapes and brushstrokes. The ethos of Studio Voltaire is to support emerging and mid-career artists at a grassroots level. This exhibition at BolteLang is an opportunity to exhibit a group of promising UK-based emerging artists in a new context. 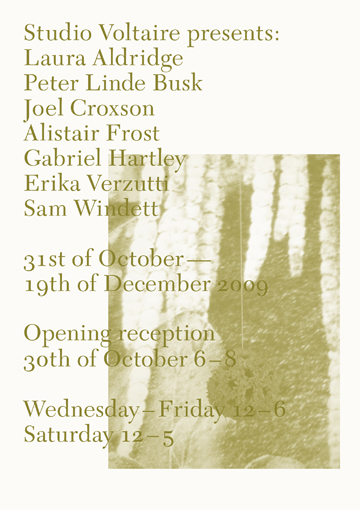 The exhibition runs from 31st October – 19th December 2009.